<source> tag used to defines the media resource for <audio> and <video> tag. 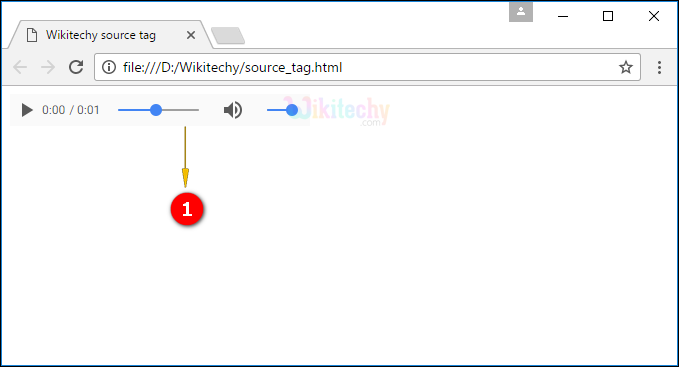 <source> tag allows multiple alternate resource files for the media elements, the browser may choose the files depends upon the media type and codec support. <source> tag supports Global Attributes and Event Attributes. HTML4 does not support <source> tag. <audio> tag used to define the media element. <source> tag used to define the resource of the media element. “src” attribute is used to set the source file location for the media element reference. There are two audio file source is mentioned, welcome.mp3, welcome.wav. Here the audio file is displayed in the output with volume adjustment.